We Are One Filipino Rally in San Jose, Saturday Sept 25th! 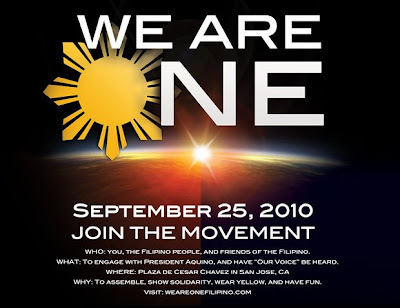 On Saturday the 25th, Jelynn will be attending the We Are One Filipino rally hosted in San Jose. The rally will be held at Cesar Chavez Park in downtown San Jose and starts at 1 pm. If you can't attend, you can follow online at the We Are One Filipino website, Twitter, Facebook page, and YouTube channel. I encourage you to watch the video below which explains some of the motivation for the rally as well as visit the website and facebook page to connect with other attendees. It should be a very exciting and fun day, so tell your friends and family!